Dodge continues its sustained assault on the car market with the introduction of the all-new 2006 Dodge Charger, Charger SRT8, Magnum, Magnum SRT8 and Viper SRT10 Coupe. 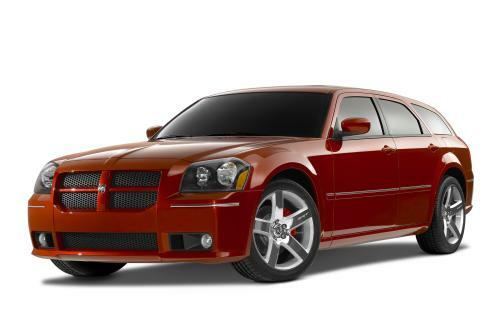 Dodge announced pricing today for the Dodge Magnum SRT8. Adding a new level of utility to the Street and Racing Technology (SRT) formula of benchmark performance at an astounding value, the 2006 Dodge Magnum SRT8 is available for $37,995, which includes $675 for destination. Dodge Magnum SRT8 arrives in Dodge showrooms this summer. "Dodge Magnum is the new shape of American muscle," said Darryl Jackson, Vice President - Dodge Marketing, Chrysler Group. .Since introducing the Dodge Magnum, we.ve increased our market share in the car market. The momentum continues with the introduction of the Dodge Magnum SRT8. "With a serious dose of SRT performance added to the mix, the 2006 Dodge Magnum SRT8 is capable of zero to 60 mph in the low-5-second range," continued Jackson. "And with nearly 72 cubic feet of cargo space, the 2006 Dodge Magnum SRT8 provides incredible utility at a tremendous value." The all-new 2006 Dodge Magnum SRT8 is powered by an SRT-engineered 6.1-liter HEMI V-8 engine producing 425 horsepower and 420 lb.-ft. of torque, and equipped with a host of performance upgrades and premium amenities. The heart of the 2006 Dodge Magnum SRT8 is its SRT-engineered 6.1-liter HEMI engine, which generates 85 more horsepower than the 5.7-liter version with more cubic inches, higher compression ratio, faster engine speed and better engine breathing through special cylinder heads and manifolds. The 6.1-liter HEMI engine was strengthened with components including a reinforced engine block, forged steel crankshaft and high-strength connecting rods. The result is an engine capable of 425 horsepower and 420 lb.-ft. of torque - the highest specific-output V-8 engine ever offered by the Chrysler Group - with a horsepower-per-liter rating that exceeds even that of the legendary 1966 Street HEMI. The all-new 2006 Dodge Magnum SRT8 is equipped with a full complement of SRT-tuned performance upgrades, including larger diameter anti-sway bars, specially tailored spring rates, Bilstein dampers, Brembo four-piston disc brakes at the front and rear, and 20-inch forged aluminum wheels shod with Goodyear F1 three-season tires. 2006 Dodge Magnum SRT8 standard features include power-adjustable, deeply sculpted and aggressively bolstered front seats trimmed with performance suede inserts that secure occupants during spirited driving. Other features include .carbon fiber. leather trim on the steering wheel, and special carbon fiber finishing on the center stack. Full instrumentation includes a 180 mph speedometer, tachometer and temperature gauges. Premium amenities include a standard AM/FM stereo radio with six-disc CD changer and steering wheel-mounted controls, and a power-adjustable pedal cluster. Options include a power sunroof, heated seats, supplemental side air bags, and load leveling and height control. Also available are SIRIUS Satellite Radio, which offers hundreds of commercial-free channels, and a UConnect hands-free communications system with Bluetooth technology. This system recognizes up to seven different Bluetooth-equipped cellular phones and responds to voice commands, utilizing a microphone in the rear-view mirror and the stereo system.s speakers for hands-free conversations. The 2006 Dodge Magnum SRT8.s exterior styling begins with its striking raised beltline and roofline pulled down tautly around the windows. Functional SRT improvements include an all-new front fascia with integrated ducts that help direct air to cool the brakes. A front air dam reduces lift, while in the rear, there is an all-new fascia with an integrated wake modifier and aggressive cutouts to accommodate dual 3.5-inch exhaust tips. Dodge Magnum SRT8 styling is also unique with a mesh grille insert with chrome trim, satin-finish front and rear bumper inserts, body-color mirrors and door handles, and unique SRT badging. Available exterior colors for the 2006 Dodge Magnum SRT8 are Bright Silver, Brilliant Black and Inferno Red Crystal Pearlcoat. The interior is offered in Dark Slate Gray/Light Graystone. Formed in 2002, SRT is the industry's leading in-house automotive performance group. SRT creates some of the Chrysler Group's boldest, most distinctive products that deliver benchmark performance at the lowest price. SRT boasts 10 SRT-badged Chrysler and Dodge performance vehicles, all of which will be in dealer showrooms by year's end: Dodge Viper SRT10 Convertible and Coupe, Dodge SRT4, Dodge Ram SRT10 regular cab and Quad Cab, Dodge Magnum SRT8, Dodge Charger SRT8, Chrysler Crossfire SRT6 Coupe and Roadster and Chrysler 300C SRT8. With a U.S. market share of seven percent, Dodge is the fifth-largest nameplate in the United States and the eighth-largest nameplate in the automotive industry. In 2004, Dodge sold more than 1.4 million vehicles in the global market. Dodge continues to lead the minivan market segment with a 20 percent market share in the United States . In the truck market, Dodge has an 18 percent market share. In the car market, Dodge has a 4.5 percent market share. The 2006 Dodge Magnum SRT8 is built at the Brampton Assembly Plant in Brampton, Ontario, Canada.